The Kodansha Kanji Synonyms Guide is a new type of reference work that enables intermediate and advanced learners to deepen their understanding of how kanji synonyms are used in contemporary Japanese. 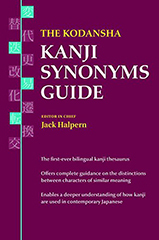 Based on the author's world renowned The Kodansha Kanji Dictionary, this new work serves as the first ever bilingual kanji thesaurus, and offers complete guidance on the precise distinctions between characters of similar meaning, referred to as kanji synonyms. Click image for larger dictionary sample. 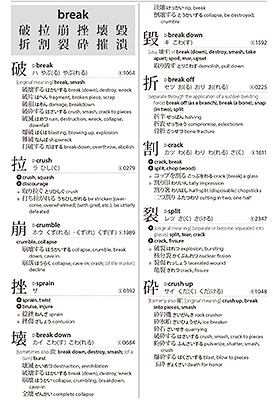 The Kodansha Kanji Synonyms Guide offers complete guidance on the precise distinctions between characters of similar meaning, referred to as kanji synonyms. Since a proper understanding of the meanings of each character is essential for the effective mastery of the Japanese vocabulary, this is of considerable benefit to the serious student. “Characters” here refers mostly to single characters (one kanji possibly followed by kana) that function mostly as word elements (components of compound words), rather than to independent words. The alphabetically-arranged group headwords, representing the shared concept for each synonym group, show how the group members resemble each other. The synonym keywords show at a glance how the group members differ from each other. The character meanings show in greater detail the distinctive features of each group member. The many compound words illustrate how each kanji functions (mostly) as a word element. It is important to note that the core meanings and character meanings serve as a practical guide to kanji usage because they are based on actual occurrences, and because they are illustrated by many compound words. These are drawn from the author’s kanji dictionaries, such as The Kodansha Kanji Dictionary, while avoiding the historical and archaic meanings often found in traditional kanji dictionaries. The new approach to the study of kanji presented here motivates the learner to explore the nuances of closely related characters by studying them together, rather than as isolated units. This helps the learner better understand their distinctive features, while stimulating a desire to learn. It also provides the educator and scholar with a valuable source of reference data for creating learning materials.